This article is about the 19th and early-20th century state. For the medieval state briefly known as the Kingdom of Bavaria, see Duchy of Bavaria. The Kingdom of Bavaria (German: Königreich Bayern) was a German state that succeeded the former Electorate of Bavaria in 1805 and continued to exist until 1918. 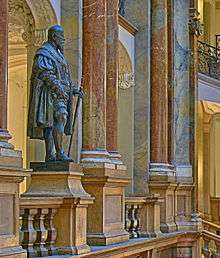 The Bavarian Elector Maximilian IV Joseph of the House of Wittelsbach became the first King of Bavaria in 1805 as Maximilian I Joseph. 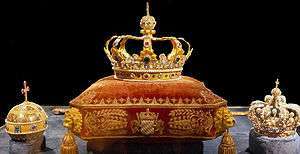 The crown would go on being held by the Wittelsbachs until the kingdom came to an end in 1918. Most of Bavaria's present-day borders were established after 1814 with the Treaty of Paris, in which Bavaria ceded Tyrol and Vorarlberg to the Austrian Empire while receiving Aschaffenburg and Würzburg. With the unification of Germany into the German Empire in 1871, the kingdom became a state of the new Empire and was second in size, power, and wealth only to the leading state, the Kingdom of Prussia. 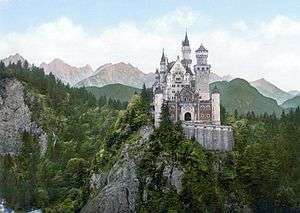 Since the end of the kingdom and the empire in 1918, Bavaria has remained part of Germany. On 30 December 1777, the Bavarian line of the Wittelsbachs became extinct, and the succession on the Electorate of Bavaria passed to Charles Theodore, the Elector Palatine. After a separation of four and a half centuries, the Palatinate, to which the duchies of Jülich and Berg had been added, was thus reunited with Bavaria. In 1792 French revolutionary armies overran the Palatinate; in 1795 the French, under Moreau, invaded Bavaria itself, advanced to Munich—where they were received with joy by the long-suppressed Liberals—and laid siege to Ingolstadt. Charles Theodore, who had done nothing to prevent wars or to resist the invasion, fled to Saxony, leaving a regency, the members of which signed a convention with Moreau, by which he granted an armistice in return for a heavy contribution (7 September 1796). Between the French and the Austrians, Bavaria was now in a bad situation. Before the death of Charles Theodore (16 February 1799) the Austrians had again occupied the country, in preparation for renewing the war with France. Maximilian IV Joseph (of Zweibrücken), the new elector, succeeded to a difficult inheritance. Though his own sympathies, and those of his all-powerful minister, Maximilian von Montgelas, were, if anything, French rather than Austrian, the state of the Bavarian finances, and the fact that the Bavarian troops were scattered and disorganized, placed him helpless in the hands of Austria; on 2 December 1800 the Bavarian arms were involved in the Austrian defeat at Hohenlinden, and Moreau once more occupied Munich. By the Treaty of Lunéville (9 February 1801) Bavaria lost the Palatinate and the duchies of Zweibrücken and Jülich. In view of the scarcely disguised ambitions and intrigues of the Austrian court, Montgelas now believed that the interests of Bavaria lay in a frank alliance with the French Republic; he succeeded in overcoming the reluctance of Maximilian Joseph; and, on 24 August, a separate treaty of peace and alliance with France was signed at Paris. The 1805 Peace of Pressburg allowed Maximilian to raise Bavaria to the status of a kingdom. Accordingly, Maximilian proclaimed himself king on 1 January 1806. The King still served as an Elector until Bavaria seceded from the Holy Roman Empire on 1 August 1806. 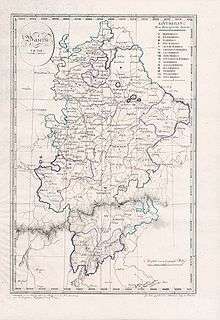 The Duchy of Berg was ceded to Napoleon only in 1806. The new kingdom faced challenges from the outset of its creation, relying on the support of Napoleonic France. The kingdom faced war with Austria in 1808 and from 1810 to 1814, lost territory to Württemberg, Italy, and then Austria. In 1808, all relics of serfdom were abolished, which had left the old empire. In the same year, Maximilian promulgated Bavaria's first written constitution. Over the next five years, it was amended numerous times in accordance with Paris' wishes. During the French invasion of Russia in 1812 about 30,000 Bavarian soldiers were killed in action. With the Treaty of Ried of 8 October 1813 Bavaria left the Confederation of the Rhine and agreed to join the Sixth Coalition against Napoleon in exchange for a guarantee of her continued sovereign and independent status. On 14 October, Bavaria made a formal declaration of war against Napoleonic France. The treaty was passionately backed by the Crown Prince Ludwig and by Marshal von Wrede. With the Battle of Leipzig in October 1813 ended the German Campaign with the Coalition nations as the victors, in a complete failure for the French, although they achieved a minor victory when an army of Kingdom of Bavaria attempted to block the retreat of the French Grande Armée at Hanau. 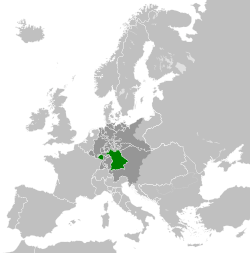 With the defeat of Napoleon's France in 1814, Bavaria was compensated for some of its losses, and received new territories such as the Grand Duchy of Würzburg, the Archbishopric of Mainz (Aschaffenburg) and parts of the Grand Duchy of Hesse. Finally in 1816, the Rhenish Palatinate was taken from France in exchange for most of Salzburg which was then ceded to Austria (Treaty of Munich (1816)). It was the second largest and second most powerful state south of the Main, behind only Austria. In Germany as a whole, it ranked third behind Prussia and Austria. On 26 May 1818, Bavaria's second constitution was proclaimed. The Landtag would have two houses, an upper house (Herrenhaus) comprising the aristocracy and noblemen, including the high-class hereditary landowners, government officials and nominees of the crown. The second house, a lower house (Abgeordnetenhaus), would include representatives of small landowners, the towns and the peasants. The rights of Protestants were safeguarded in the constitution with articles supporting the equality of all religions, despite opposition by supporters of the Roman Catholic Church. The initial constitution almost proved disastrous for the monarchy, with controversies such as the army having to swear allegiance to the new constitution. The monarchy appealed to the Kingdom of Prussia and the Austrian Empire for advice, the two refused to take action on Bavaria's behalf, but the debacles lessened and the state stabilized with the accession of Ludwig I to the throne following the death of Maximilian in 1825. Within the Kingdom of Bavaria, the Palatinate enjoyed a special legal and administrative position, as the Bavarian government maintained substantial achievements of the French period. The German historian Heiner Haan described the special status of the Palatinate within Bavaria as a relation of "Hauptstaat" (main state, i.e. Bavaria) and "Nebenstaat" (alongside state, i.e. the Palatinate). In 1825, Ludwig I ascended the throne of Bavaria. Under Ludwig, the arts flourished in Bavaria, and Ludwig personally ordered and financially assisted the creation of many neoclassical buildings and architecture across Bavaria. Ludwig also increased Bavaria's pace towards industrialization under his reign. In foreign affairs under Ludwig's rule, Bavaria supported the Greeks during the Greek War of Independence with his second son, Otto being elected King of Greece in 1832. As for politics, initial reforms advocated by Ludwig were both liberal and reform-oriented. However, after the Revolutions of 1830, Ludwig turned to conservative reaction. The Hambacher Fest in 1832 showed the discontent of the population with high taxes and censorship. Bavaria joined the Zollverein in 1834. In 1835 the first German railway was constructed in Bavaria, between the cities of Fürth and Nuremberg. In 1837, the Roman Catholic-supported clerical movement, the Ultramontanes, came to power in the Bavarian parliament and began a campaign of reform to the constitution, which removed civil rights that had earlier been granted to Protestants, as well as enforcing censorship and forbidding the free discussion of internal politics. This regime was short-lived due to the demand by the Ultramontanes of the naturalization of Ludwig I's Irish mistress, which was resented by Ludwig, and the Ultramontanes were pushed out. Following the Revolutions of 1848 and Ludwig's low popularity, Ludwig I abdicated the throne to avoid a potential coup, and allowed his son, Maximilian II, to become the King of Bavaria. Maximilian II responded to the demands of the people for a united German state by attending the Frankfurt Assembly, which intended to create such a state. But when Maximilian II rejected the Frankfurt Constitution in 1849 an uprising in the Bavarian Palatinate under Joseph Martin Reichard was put down with the support of Prussian forces. However Maximilian II stood alongside Bavaria's ally, the Austrian Empire, in opposition to Austria's enemy, the Kingdom of Prussia, which was to receive the imperial crown of a united Germany. This opposition was resented by many Bavarian citizens, who wanted a united Germany, but in the end Prussia declined accepting the crown and the constitution of a German state they perceived to be too liberal and not in Prussia's interests. In the aftermath of the failure of the Frankfurt Assembly, Prussia and Austria continued to debate over which monarchy had the inherent right to rule Germany. A dispute between Austria and the Electoral Prince of Hesse-Kassel (or Hesse-Cassel) was used by Austria and its allies (including Bavaria) to promote the isolation of Prussia in German political affairs. This diplomatic insult almost led to war when Austria, Bavaria and other allies moved troops through Bavaria towards Hesse-Kassel in 1850. However the Prussian army backed down to Austria and caved in to the acceptance of dual leadership. This event was known as the Punctation of Olmütz but also known as the "Humiliation of Olmütz" by Prussia. This event solidified the Bavarian kingdom's alliance with Austria against Prussia. 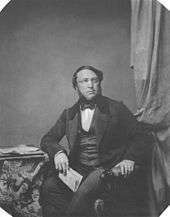 When the project to unite the German middle-sized powers under Bavarian leadership against Prussia and Austria (the so-called Trias) failed Minister-President Von der Pfordten resigned in 1859. Attempts by Prussia to reorganize the loose and un-led German Confederation were opposed by Bavaria and Austria, with Bavaria taking part in its own discussions with Austria and other allies in 1863, in Frankfurt, without Prussia and its allies attending. In 1864, Maximilian II died early, and his eighteen-year-old son, Ludwig II, became King of Bavaria as escalating tensions between Austria and Prussia grew steadily. Prussia's Minister-President Otto von Bismarck, recognizing the immediate likelihood of war, attempted to sway Bavaria towards neutrality in the conflict. Ludwig II refused Bismarck's offers and continued Bavaria's alliance with Austria. In 1866, violence erupted between Austria and Prussia and the Austro-Prussian War began. Bavaria and most of the south German states, with the exception of Austria and Saxony, contributed far less to the war effort against Prussia. The Battle of Langensalza was fought on 27 June 1866 near Bad Langensalza, between the Kingdom of Hanover (Hanoverians) and the Prussians. The Hanoverians won the battle but were then surrounded by a larger and reinforced Prussian army, and, unable to link up with their Bavarian allies to the south, they surrendered. Austria then quickly faltered after its defeat at the Battle of Königgrätz (3 July 1866) and was totally defeated by Prussia shortly afterward. The states of the German Confederation could not agree on a uniform warfare with a common battle plan during the entire course of the war. Their armies were therefore beaten successively by Prussia, so also the Bavarians in Lower Franconia at Bad Kissingen (10 July 1866). The Bavarian army under Prince Karl Theodor of Bavaria was finally beaten shortly afterwards at Uettingen (26 July 1866). Finally Bavaria lost Gersfeld and Bad Orb to Prussia. They were become part of Hesse-Nassau province, which was created after the war. Austria was humiliated by defeat and was forced to concede control, and its sphere of influence, over the south German states. Bavaria was spared harsh terms in the peace settlement. However, from this point on it and the other south German states steadily progressed into Prussia's sphere of influence. With France's defeat and humiliation against the combined German forces, it was Ludwig II who proposed that Prussian King Wilhelm I be proclaimed German Emperor or "Kaiser" of the German Empire ("Deutsches Reich"), which occurred in 1871 in German occupied Versailles, France. The territories of the German Empire were declared, which included the states of the North German Confederation and all of the south German states, with the major exception of Austria. The Empire also annexed the formerly French territory of Alsace-Lorraine, due in large part to Ludwig's desire to move the French frontier away from the Palatinate. An 1890s photochrom print of Castle Neuschwanstein. This castle was designed and constructed during the reign of Ludwig II and remains, today, a major tourist attraction in Bavaria. Bavaria's entry into the German Empire changed, from jubilation over France's defeat, to dismay shortly afterward, over the direction of Germany under the new German Chancellor and Prussian Prime Minister, Otto von Bismarck. The Bavarian delegation under Count Otto von Bray-Steinburg had secured a privileged status of the Kingdom of Bavaria within the German Empire (Reservatrechte). Within the Empire the Kingdom of Bavaria was even able to retain its own diplomatic body and its own army, which would fall under Prussian command only in times of war. The crown passed to Ludwig's brother Otto I. However, Otto himself had a long history of mental illness, and had been placed under medical supervision a few months earlier. The duties of the throne actually rested in the hands of the brothers' uncle, Prince Luitpold, who had begun serving as regent for Ludwig II a few days earlier. During the regency of Prince-Regent Luitpold, from 1886 to 1912, relations between Bavarians and Prussians remained cold, with Bavarians remembering the anti-Catholic agenda of Bismarck's Kulturkampf, as well as Prussia's strategic dominance over the empire. Bavaria protested Prussian dominance over Germany and snubbed the Prussian-born German Emperor, Wilhelm II, in 1900, by forbidding the flying of any other flag other than the Bavarian flag on public buildings for the Emperor's Birthday, but this was swiftly modified afterwards, allowing the German imperial flag to be hung side by side with the Bavarian flag. The Catholic-conservative Patriotic Party founded in 1868 became the leading party in the Bavarian Landtag (Parliament). In 1887 its name was changed to Bavarian Centre. In 1893 the Social Democrats were elected to the parliament. From 1903 the University Education was also possible for female students. In 1906 a liberalization of the suffrage was carried out. With the Centre politician Georg von Hertling the Prince-Regent appointed to the head of government for the first time a representative of the Landtag's majority. Luitpold's years as regent were marked by tremendous artistic and cultural activity in Bavaria where they are known as the Prinzregentenjahre ("The Prince Regent Years"). In 1912, Luitpold died, and his son, Prince-Regent Ludwig, took over as regent. By then, it had long been apparent that Otto would never be able to reign, and sentiment grew for Ludwig to become king in his own right. On 6 November, a year after the Landtag passed a law allowing him to do so, Ludwig ended the regency, deposed Otto and declared himself King of Bavaria as Ludwig III. The Prinzregentenzeit ("prince's regent's time"), as the regency of Luitpold is often called, was due to the political passiveness of Luitpold an era of the gradual transfer of Bavarian interests behind those of the German empire. In connection with the unhappy end of the preceding rule of King Ludwig II this break in the Bavarian monarchy looked even stronger. Finally, the constitutional amendment of 1913 brought the determining break in the continuity of the king's rule in the opinion of historians, particularly as this change had been granted by the Landtag as a House of Representatives and meant therefore indirectly the first step from constitutional to the parliamentary monarchy. Today the connection of these both developments is regarded as a main cause for the unspectacular end of the Bavarian kingdom without opposition in the course of the November revolution of 1918. However the course of his 26-year regency Luitpold knew to overcome, by modesty, ability and popularity, the initial uneasiness of his subjects. These prince regent's years were transfigured, finally—above all in the retrospect – to a golden age of Bavaria, even if one mourned the "fairy tale king" Ludwig II furthermore what happens in a folkloric-nostalgic manner till this day. With the establishment of the German Empire, a series of conventions brought the bulk of the various state military forces directly under the administration of the Prussian War Ministry. Bavaria however maintained a degree of autonomy in peacetime, with its own two (later three) army corps remaining outside the Prussian order of battle. The Bavarian infantry and cavalry regiments retained their historic light blue and green uniforms, distinctive from the Prussian model adopted throughout most of the army. 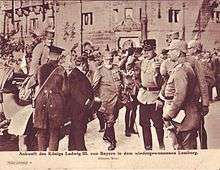 The individual Bavarian soldier swore an oath of loyalty to King Ludwig, though in wartime this pledge of obedience was extended to Kaiser Wilhelm as supreme commander. In July 1914, the Bavarian Army numbered 92,400 or 11 percent of the total Imperial Army. In 1914, a clash of alliances occurred over Austria-Hungary's invasion of Serbia following the assassination of Austrian Archduke Franz Ferdinand by a Bosnian Serb militant. Germany went to the side of its former rival-turned-ally, Austria-Hungary, and declared war on France and Russia. Following the German invasion of neutral Belgium the United Kingdom declared war on Germany. Initially, in Bavaria and all across Germany, recruits flocked enthusiastically to the German Army. At the outbreak of World War I King Ludwig III sent an official dispatch to Berlin to express Bavaria's solidarity. Later Ludwig even claimed annexations for Bavaria (Alsace and the city of Antwerp in Belgium, to receive an access to the sea). His hidden agenda was to maintain the balance of power between Prussia and Bavaria within the German Empire after a victory. Over time, with a stalemated and bloody war on the western front, Bavarians, like many Germans, grew weary of a continuing war. In 1917, when Germany's situation had gradually worsened due to World War I, the Bavarian Prime Minister Georg von Hertling became German Chancellor and Prime Minister of Prussia and Otto Ritter von Dandl was made new Prime Minister of Bavaria. Accused of showing blind loyalty to Prussia, Ludwig III became increasingly unpopular during the war. In 1918, the kingdom attempted to negotiate a separate peace with the allies but failed. By 1918, civil unrest was spreading across Bavaria and Germany; Bavarian defiance to Prussian hegemony and Bavarian separatism being key motivators. On 7 November 1918, Ludwig fled from the Residenz Palace in Munich with his family. He was the first of the monarchs in the German Empire to be deposed. A few days later William II abdicated the throne of Germany. Ludwig took up residence in Austria for what was intended to be a temporary stay. On 12 November, he issued the Anif declaration, which released his soldiers and officials from their oath to him. Although he never formally abdicated, the socialist-led government of Kurt Eisner took Ludwig's declaration as such and declared the Wittelsbachs deposed. With this the 700-year rule of the Wittelsbach dynasty came to an end, and the former Kingdom of Bavaria became the Free State of Bavaria, which it is still named today. The funeral of Ludwig III in 1921 was feared or hoped to spark a restoration of the monarchy. Despite the abolition of the monarchy, the former King was laid to rest in front of the royal family, the Bavarian government, military personnel, and an estimated 100,000 spectators, in the style of royal funerals. Prince Rupprecht did not wish to use the occasion of the passing of his father to attempt to reestablish the monarchy by force, preferring to do so by legal means. Cardinal Michael von Faulhaber, Archbishop of Munich, in his funeral speech, made a clear commitment to the monarchy while Rupprecht only declared that he had stepped into his birthright. 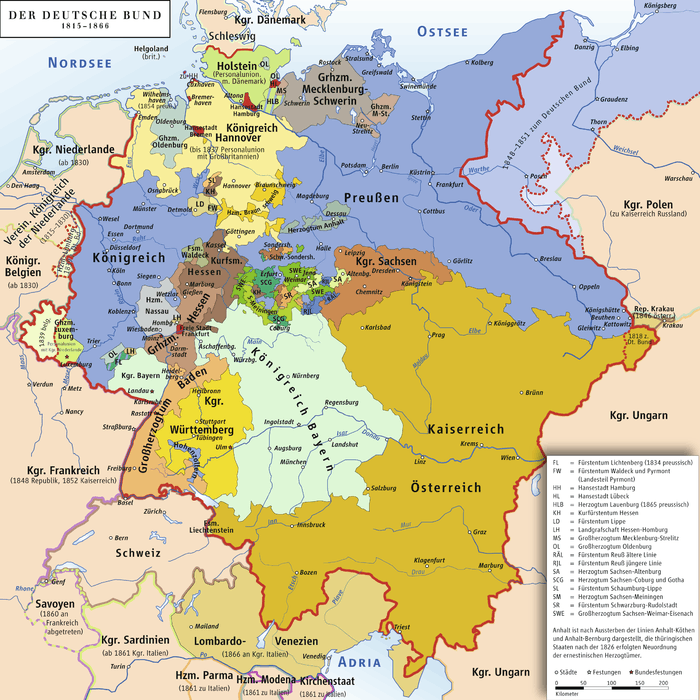 When Napoleon abolished the Holy Roman Empire, and Bavaria became a kingdom in 1806, its area reduplicated. Tyrol (1805–1814) and Salzburg (1810–1816) were temporarily reunited with Bavaria but finally ceded to Austria. 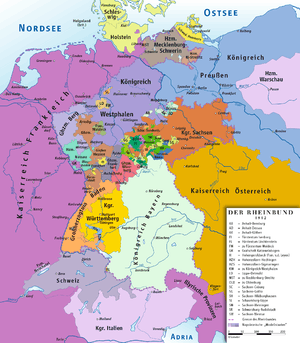 In return the Rhenish Palatinate and Franconia were annexed to Bavaria in 1815. 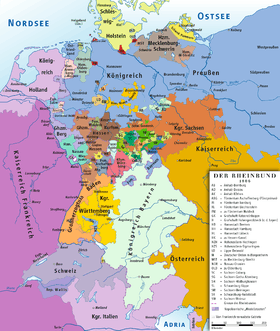 After the founding of the kingdom the state was totally reorganised and, in 1808, divided into 15 administrative government districts (Regierungsbezirke (singular Regierungsbezirk)) in Bavaria called (Kreise (singular Kreis)). They were created in the fashion of the French departements, quite even in size and population, and named after their main rivers: Altmühl-, Eisack-, Etsch-, Iller-, Inn-, Isar-, Lech-, Main-, Naab-, Oberdonau-, Pegnitz-, Regen-, Rezat-, Salzach- and Unterdonaukreis Because of the numerous territorial changes in 1810 and 1815, the divisions needed to be adjusted and the number of Kreise was reduced to 8: Isar-, Unterdonau-, Oberdonau-, Regen-, Rezat-, Untermain-, Obermain- and Rheinkreis. As of 1838, at the instigation of King Ludwig I, the Kreise were renamed after the former historical tribes and territories of the respective area in: Upper Bavaria, Lower Bavaria, Swabia and Neuburg, Upper Palatinate and Regensburg, Middle Franconia, Lower Franconia and Aschaffenburg, Upper Franconia and Palatinate. The town names of Neuburg, Regensburg and Aschaffenburg were later dropped. Accordingly, the king changed his royal titles to Ludwig, King of Bavaria, Duke of Franconia, Duke in Swabia and Count Palatine of the Rhine which were kept by his successors. 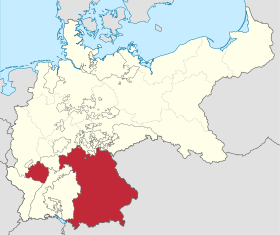 The Palatinate (formerly Rheinkreis) which Bavaria had acquired was mainly the western part of the former Electorate of the Palatinate. Ludwig's plan to acquire also the former eastern part could not be realized. The Electorate, a former dominion of the Bavarian Wittelsbach dynasty, had been split up in 1815, the eastern bank of the Rhine with Mannheim and Heidelberg was given to Baden. The western bank was granted to Bavaria as compensation for the loss of Tyrol and Salzburg. After the Austro-Prussian War (1866) in which Bavaria had sided with defeated Austria, it had to cede several Lower Franconian districts to Prussia. The duchy of Coburg was never part of the Kingdom of Bavaria since it was annexed to Bavaria only in 1920. Ostheim was added to Bavaria in 1945. In the first half of the 20th. century, the initial terminology of Kreis and Bezirk gave way to Regierungsbezirk and Landkreis. ↑ "Forschung - Universität Regensburg". Uni-regensburg.de. Retrieved 2012-09-09. ↑ Seaton, Albert. The Army of the German Empire 1870-1888. pp. 24 & 26. ISBN 0-85045-150-7. ↑ Thomas, Nigel. The German Army in World War I. p. 3. ISBN 1-84176-565-1.